This Sicilian cooked vegetable salad gets its flavour from the combination of vegetables and the sweet and sour mixture of sugar amd vinegar. We learned a version of this at Maria Grammatico’s La Scuola de Cucina in Trapani. Serve as a salad, a side dish or a sauce for pasta. 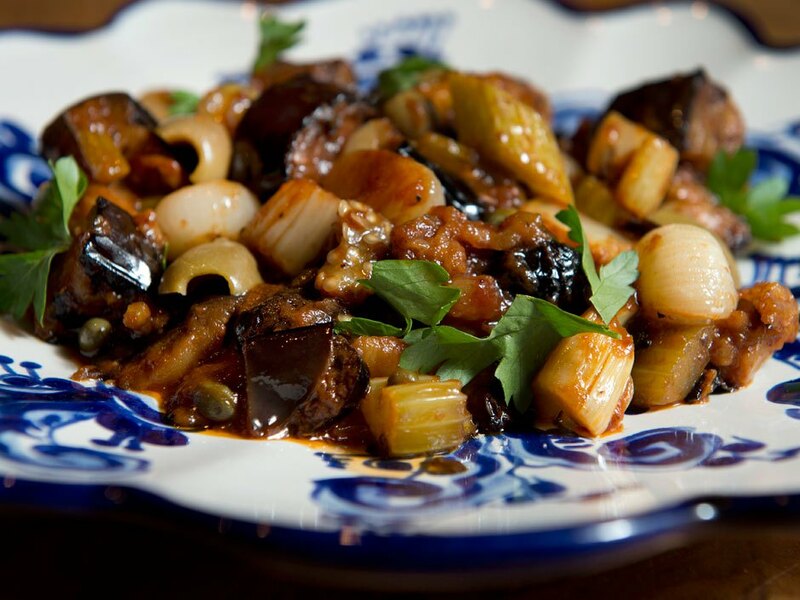 Peter J. Thompson/National Post Sicilian caponata: proof that veggie dishes can have plenty of depth of flavour. 1. Heat oil in a large deep skillet on medium-high. Add eggplant, in batches if necessary, and cook 10 to 15 minutes until browned. Remove eggplant to a large bowl. Add more oil to the pan if necessary. 2. Add celery to pan and cook 5 to 6 minutes until partially tender and golden brown. Add to the eggplant. 3. Add onions to pan and cook 10 to 15 minutes until tender and browned. Add celery and eggplant back to pan along with tomato purée, black and green olives and capers. Add 1 tsp salt and 1/4 tsp pepper. Cook gently 10 minutes. 4. Bring vinegar and sugar to a boil in a small saucepan. Stir into vegetables. Cook a few minutes. 5. Add parsley and cool. Season to taste. Serve at room temperature. This entry was posted in Chalkidiki Olives, green olive products, Inolivia marinated, Inolivia olives, Inolivia pitted, Recipes and tagged caponata, Chalkidiki Green Olives, inolivia, olives. Bookmark the permalink.